What Will You Do with Those Pumpkins? 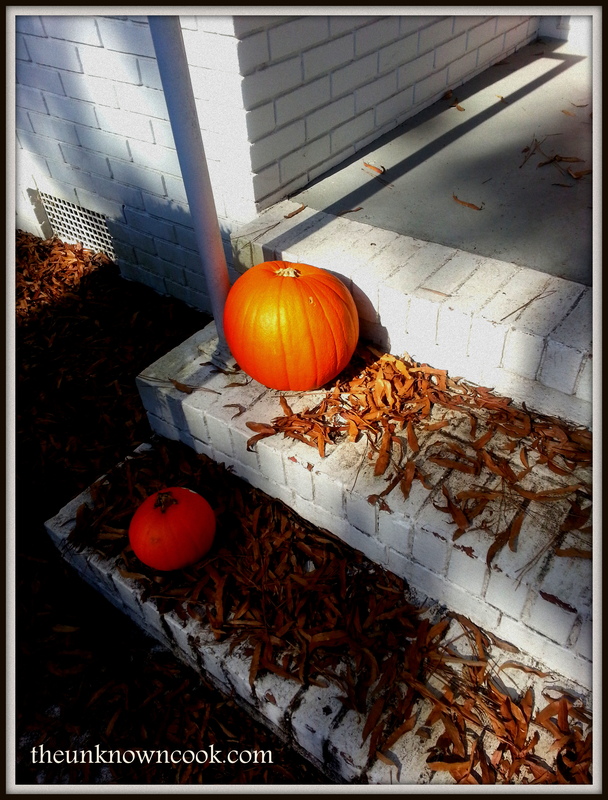 Lonely pumpkins sitting on the doorsteps of our home. This is about to change! I really hate to admit this. I am the kind of person who will leave Christmas lights up year round if my wife didn’t make me take them down. It takes a lot of work to wrap a string of lights around a tree. Now I have to climb a ladder and hang them around the house? No, don’t make me! I like the Christmas trees that are already installed with lights and all you have to do is plug and play. We brought the pumpkins inside and my wife and daughter scoured the web for the best pumpkin recipes. There were many and it took them a while to settle on what they wanted to make. Both their pumpkin ideas came from All Recipes website. I thought I would get out of this project without doing a thing. I did not succeed. I was tasked with making the frosting for the cake. I took it a little far with the decorating of the cake. I did enjoy it though. Take a look at the finished products below. If you want ideas of what to do with your pumpkins, give the All Recipes site a shot. Who knew pumpkins could taste so good? Posted on January 3, 2015, in Uncategorized and tagged best buttercream frosting recipe, best pumpkin recipes, buttercream frosting, how to cook pumpkins, pumpkin bundt cake, pumpkin cake, pumpkin desserts, pumpkin mini cakes, pumpkin muffins, rum buttercream frosting. Bookmark the permalink. 4 Comments. Dude, I made some pumpkin loafs before and I am here to tell you they were delicious! Hope I still have my recipe lying around. Love your family’s ideas. Rytaree, I’ve done the pumpkin pie but this route with pumpkin did prove to be tasty. Thank you kindly. Thank you Ritu. I look forward to your great dishes.